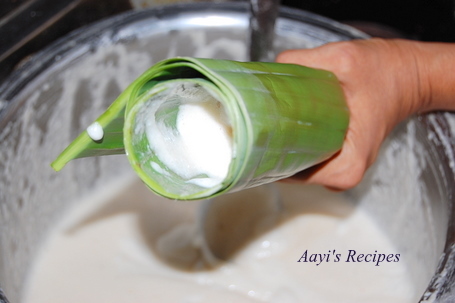 We had posted the traditional way of making Hittu/khotte or kadubu couple of years ago. Making the baskets for these is a time consuming work and takes some expertise. Any mistake and the idli batter comes out of the baskets and makes a mess. So here are some easy ways of making these delicious hittus. 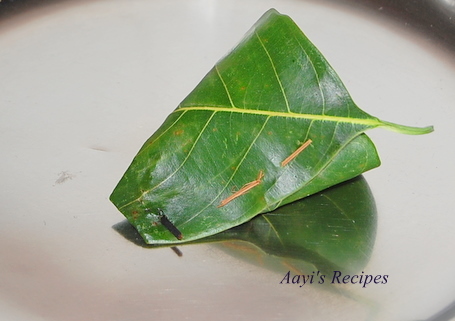 Usually(atleast at our place), hittu is prepared in jackfruit leaves. But these are hard to find everywhere. 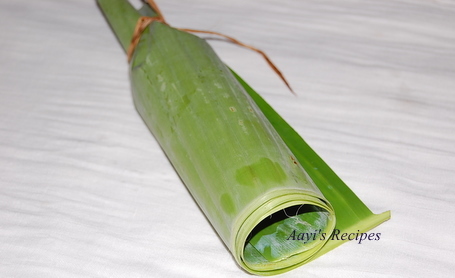 Instead, you can use banana leaves which can be found readily in many places. Here is a step by step pictorial of how this is prepared. 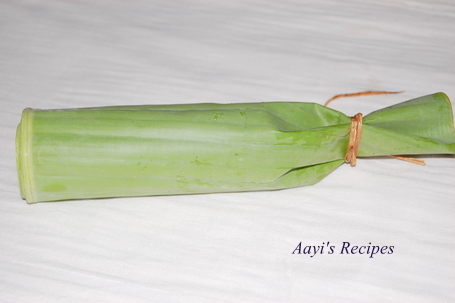 The traditional hittu requires 4 leaves. Here is an easy way to make this with only one leaf. Be very careful while steaming these. Lovely pictorial! I can always expect to learn a new and unique cooking technique here. I am curious to know about the curry that is in the pic. It looks yummy combo :).. Can you please let me know? MANY MANY THANKS FOR SHOWING THE PICTORIAL REPRESENTATION .THIS SURELY LOOKS EASY. Very nice pictorial explanation. Could you please also let us know what kind of gravy is there in the picture. That is very tempting. What is the gravy on the side, Shilpa ? Suddenly reminded of grandma and hittilu with jackfruit tree. Thanks for the recipe. Does the flavour change for banana one? …THIS IS ONE MY FAVORITE .IT LOOKS SO YUMMY…I JUST LOVE TO EAT WITH MACKEREL CURRY.. 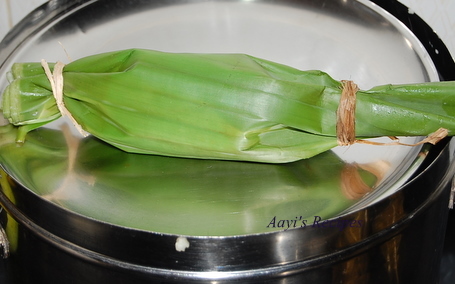 I really love ur traditional konkani postings, this banana leaves one will certainly be an easy one to make.Two things u need to clarify, Should we have to take tender jackfruit leaves, they broke off, when i tried to make the moulds at my native, thanjavur.Next i use beydagi chillies, while grinding and like the red colour it gives, but when it comes to chilly powder, what to do, at hyd, bydagi chilli powder is not available and mtr chilli powder does not have that colour. That made me soooo nostalgic I want to leave for India, like today.. 🙂 Thanks for sharing! This is a very good idea Varadmayi. It never occured to me that we can do like this. 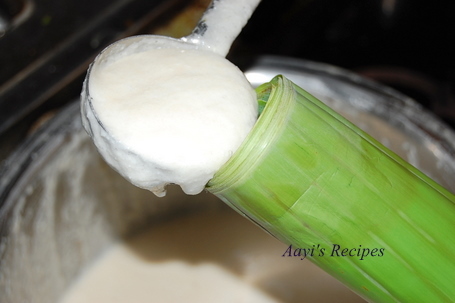 Putting a leaf in the pedavan and cooking the idly batter is easy. But this type it comes out clean and neat and looks nice also. Easy to serve. No mess. I am very eager to prepare khotto like this. Thanks for the idea. i had heard tht some fish items are also prepared this way. very nice pictorial..
Nice recipe… with good pics. Wow. 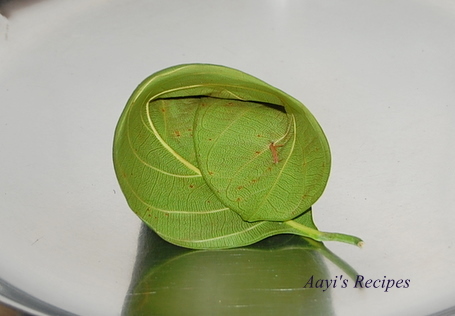 The second small leaf that you have shown, my grand ma makes similar ones in Goa. Especially how you have stiched the ends with twig. You brought back those lovely ‘ol memories! Wow…the banana leaf one looks easier for a novice like me! Varadmayi you rock!! Even the single leaf one looks nice…will try that. But single jackfruit leaf khotto will be smaller than the 4 leaf ones, na vey? Yes Varsha, they are quite smaller. May not be a good idea in large scale, but definitely helps a lot for people like me who cook for few people. Saves a ton of time. We do make khotte on normal days too (not just for festivals). Aayi always makes the perfect baskets, but she told me these methods to make my life easier. Thanks for the lovely recipe. I have one question–the color of the the gravy in this post is a lovely reddish whereas it is pale yellow in the original post–why is that? Because of the different type of chillies used. I have been reading your blog off and on for some time now, and this is the first time I am commenting. 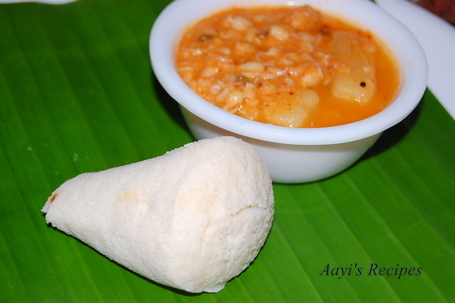 The idlis look so so good. I had khotto idli for the first time this year at a place in Mumbai famous for its khotto idlis. It was so good. And now that I see the first pic in your post, I am drooling over it. The banana leaf method looks pretty easy. Where do you get banana/jackfruit leaves from here in US? Beautiful presentation. Being myself a grandmother at Mangalore, it was a happy sight ,our Khotto and Mooga Ghassi going really Global. 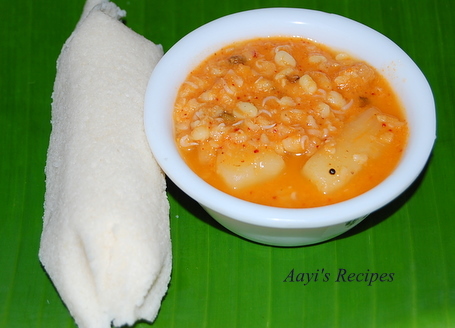 An easier way of making Khotto is to just place two leaves of Jackfruit or two pieces of banana leaves in the normal Iddli Donno ( Katori ) or in the Idli stand , and just steam the normal way. 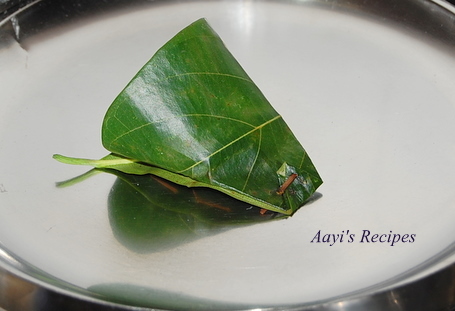 You will get a khotto or idli flavoured with the relevant leaf. This is for people who do not get the usual shigir ( tiny sticks ) , or do not get the time to make the baskets. Keep this blog rolling. All the very best. Today i tried your recipie of maida barfi and the taste was WOW ,too good but i have one query that after i greased the dish with ghee , and when the maida mixture cooled down i found it hard to cut those.can you suggest me what to do next time. This a perfect alternative since we dont get jackfruit leaves here. 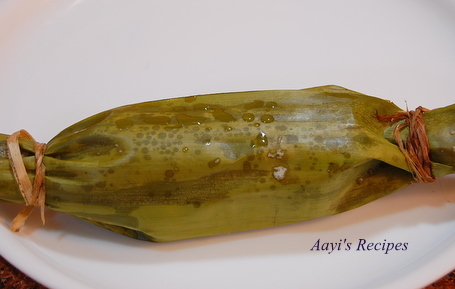 My mom was thrilled with this idea.. we are going to try this out soon and make some hesaru bele tove to go with it. Thank you Shilpa… you are the best!